- Reduce payroll disputes and improve accuracy to save time andmoney.- Improve communication with field workers with English orSpanish options for increased safety and efficiency.- Improveproductivity with faster, more accurate time recording. *Requires Equipment360/FuelerPlus Server v2016.0.0 or higher*Managing fuel consumption can be a challenge. This difficulty isoften due to the number of different systems you use to capturedifferent fuel data. With FuelerPlus, all your data is gatheredfrom the different systems you use, and delivered in an easy-to-useformat. FuelerPlus can capture everything from your fuelers,including topping off fluids and servicing your equipment. Mobileintegration allows your foreman to enter in all of their fueltickets and tracking information from the field through aneasy-to-use mobile system. - Reduce payroll disputes and improve accuracy to save time andmoney.- Help eliminate employee schedule confusion and ensureworkers are at the right place on time.- Improve communication withfield workers with English or Spanish options for increased safetyand efficiency.- Improve productivity with faster, more accuratetime and cost code recording. - Reduce payroll disputes and improve accuracy to save time andmoney. - Help eliminate employee schedule confusion and ensureworkers are at the right place on time. - Improve communicationwith field workers with English or Spanish options for increasedsafety and efficiency. - Improve productivity with faster, moreaccurate time and cost code recording. HCSS Broker provides a simple andeasy-to-useinterface to the scheduling side of the trucking world.View yourupcoming orders and schedule drivers instantaneously withthe touchof a button. With HCSS Broker, you can:- View upcoming orders for your company.- Assign drivers quickly and easily.- Set driver start time and special instructions.- Create sub-orders for different contractors.- See changes to your orders and driver assignments as soon astheyare made. The Crew App allows you to see how many Employees are clocked inandwhere they are located. 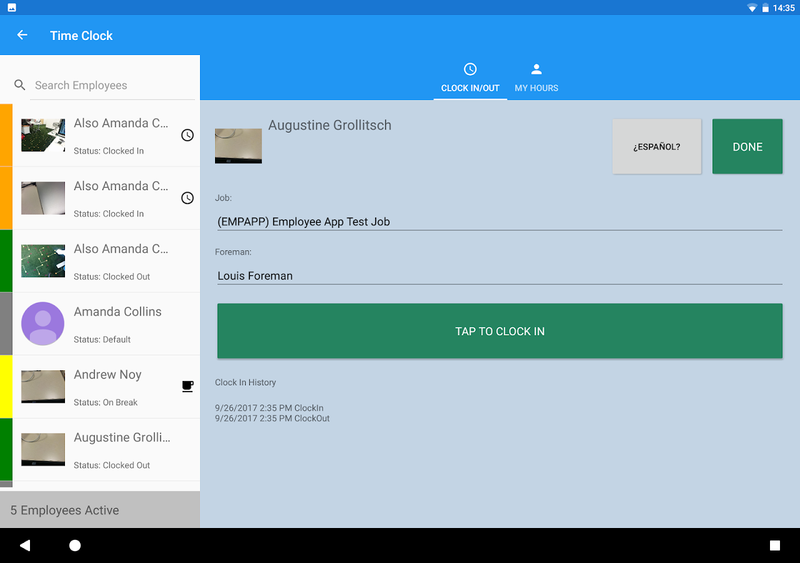 Invite Employees to the Employee Appthrougha text message.- Invite new Employee App / Time ClockEmployees.-See how many employees are clocked in and to what job. Finally, an app just for construction pros. I Build America isamovement to promote pride in the construction industry,showcaseits impact on everyday lives, and recruit young peopleintorewarding construction careers.Use this app to:- Take photos,addIBA stickers, and share with your friends.- Shop theconstructionbrand of apparel at the IBA store.- Be a part of theconstructionconversation on the IBA feed. Are you tired of always write on a piece of paper and at the end ofthe month to deal with the calculator ? Let Working Hours 4b helpyou ! Working Hours 4b through an easy and intuitive interfaceallows you to enter your work hours that may contain: - Regularhours - Extra: Early entry and Overtime - Pause (paid or unpaid) -Bonus - Expense - An icon and a note You can calculate your gain: -Monthly - Weekly - Biweekly - Fortnightly (14 or 15 days) - Annual- Custom interval With the calendar inside you can enter, edit andobserve the intervals of your working hours for each month byconsulting the details divided by hours and earnings: - Regularhours - Extra: Early entry and Overtime - Paid pause - Unpaid pause- Total - Holidays - Notes Paid/Unpaid indicator: With thePaid/Unpaid indicator you can track your paid or unpaid workinghours. Never forget again any payment ! Work intervals can cover amaximum of 48 hours which gives you the ability to insert both thedaily hours, or night. Holidays: You can insert Holidays and Sickleave into the calendar and count them any time. Export your datain any format do you want and send send it directly with any app doyou want! The supported formats are: - Text - CSV - PDF Do you havemultiple ranges that are substantially the same for different daysof the week but that may change for very little? No problem! Withthis app you can insert multiple templates and add them are yourpreferred date! Do you have multiple jobs or clients? MultipleJobs: Add how many jobs do you want with different colors and notesand distinguish the events into the calendar At a glance!Statistics: You can see your earnings or your annual hours (monthby month) and monthly (day by day) through the graph. The eventscomponents can be configurate at will! Notifications: Never forgetto add the worked hours! You can choose a time and select the daysof the week. The application will notify you every time! Floatingbadge: Don’t you remember when you get to work? With the floatingbadge on your home you have the opportunity to mark the time ofentry, pause, start of extra hours and insert the interval at theend of the period in which you worked. Data Synchronization: Withan account you can synchronize multiple devices in real time! Youdon’t like accounts? Login as anonymous ! For bugs, errors andideas join the community: Google:https://plus.google.com/communities/105414428070139346369 Facebook:https://www.facebook.com/working.hours.4b Twitter:https://twitter.com/workingHours4b Or send an email in the Contactsection of the options! Work Log is a quick, easy and free way to keep track of your shiftsand calculate the number of hours worked and wages paid over yourpay period. ★ Fast, simple and straightforward way to track yourhours, expenses, tips, mileage and more ★ Save time with featureslike automatic break deduction and pay period settings ★ Usewidgets to punch in and out quickly, or as a shortcut to add a newshift. (tap on the punch in time to cancel it) ★ Punch In and out,or enter your hours manually ★ Customize how Work Log looks withoptions like date and time formatting, when your week starts and alight or dark theme ★ View your hours in a variety of ways such asby week, month, pay period or all of your shifts at once ★ Set yourpay period to automatically calculate how many hours you worked andyour wages for each paycheck ★ Track as many details as you wantwith a variety of tracking options like Expenses, Tips, Sales,Mileage, Holiday Pay and more ★ Have deductions and/or bonusesautomatically calculated for paycheck estimates ★ Keep track ofovertime hours and wages for up to two separate overtimes Installwith Work Log Pro for extra features like tracking multiple jobs,removing ads, exporting all data as a spreadsheet (.CSV), as wellas backup and import all saved data as a database via email.